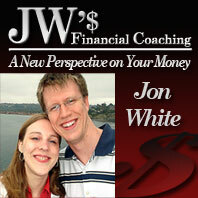 JW's Financial Coaching Podcast-Money and Marriage with special guest Lisa White | JW's Financial Coaching-Giving you a new perspective on your money! We have a special guest on today’s show, my best friend and wife Lisa stops by to discuss money and marriage. In our two plus years of marriage we have been DINKS, a one income family, and now a family with a stay at home mom. Lisa and I discuss how we managed our finances throughout those stages as well as how we discovered we were both savers and how nerds and free spirits can get along financially. Want to get your spouse on board? Lose the battle, win the war! If you are debt free and want to share your story with me on a future podcast, please contact me today as I am getting ready to do a new podcast series starting in the fall and I would love to share your story on air! This entry was posted in Financial Plan, Guests, Marriage, Money Saving Tips, Personal Story, Podcast and tagged Financial Podcast, Guests, Love and Money, Marriage and Money, Money and Marriage. Bookmark the permalink.